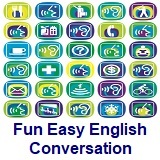 ﻿ Fun Easy English - new classroom free online classes english language lessons speaking listening writing reading april 12. 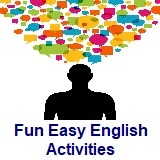 Today in the Fun Easy English classroom you are going to take a little time away from formal English study and learn spelling and vocabulary using a Fun Easy English activity. Crossword puzzles are a fantastic way to learn spelling and new vocabulary. This game has been around since at least the late 1800's and maybe even earlier. 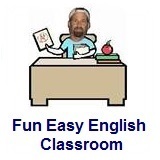 I am including this activity on several pages of the classroom. Shirley: Would you like some cookies? I just made them. Louise: Thank you. Yes, I would. Shirley: These are chocolate, and those are almond­flavored. Louise: I guess I’ll try a chocolate one first. Mmmm…this is delicious. Are they hard to make? 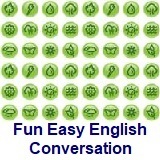 Shirley: No, they’re really quite easy. Wait a minute, I’ve got the recipe right here. See…these are the ingredients, and then you just follow the directions. Louise: That does look easy. I think I’ll make some tonight. This is equivalent to Would you like to have some (of these) cookies? It is a more courteous form than Do you want some cookies? 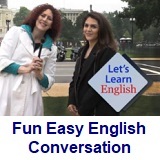 Notice that the stress falls on chocolate, since one, when used as a pronoun, is normally unstressed. A sound denoting gustatory enjoyment. A useful pattern. 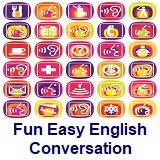 Some additional examples: Is that hard to do? Are these books difficult to read? Is that paper hard to write on? My new car is easy to drive. These shirts are easy to wash and iron. The emphatic form of That looks easy. Note the strong stress on does.